A luxurious, colour protecting mask, the Shu Uemura Art of Hair Color Lustre Masque (200ml) is designed for natural to colour treated hair. 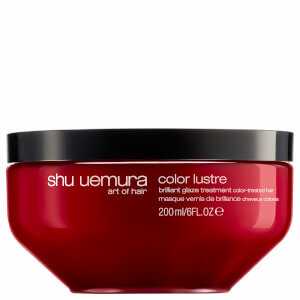 It nourishes your locks and provides them with a polished look. It is infused with rich musk rose oil and goji berry extract to protect the hair and its colour. The mask is made for weekly use on fine hair or daily use on thick hair instead of a conditioner and gives weightless shine with every wash. The Rose of Japan scent of this mask is composed of fruity, floral and woody notes and will transform your daily shower into an adventure. L.B. Directions for use: After shampooing, massage into damp hair. After 2-3 minutes, rinse out. For finer hair, use as weekly treatment. For thicker hair, use daily in place of conditioner.